Management Mode is used to upload a new firmware image to recover the router. You should be able to recover the router in most situations. NOTE: This article applies to the WRT54G Version 5 only. To find the model number of your Linksys device, click here. The router has been reset incorrectly. The computer that will be used for the recovery MUST be wired to the router via an Ethernet cable. Make sure to have a local copy of WRT54G Version 5 firmware that you can use for recovery. To download the latest firmware, click here. For a list of downloadable files, click here. In most cases, the router will be able to provide an IP Address via DHCP when in Management Mode. If your computer does not automatically receive an IP Address from the router, you will have to set up a static IP Address for the upgrade. To learn how, click here. When the router is forced into Management Mode, the Power light will blink. Unplug the power cord from the back of the router. Press and hold down the Reset button. While holding down the Reset button, plug the power cord back in to the router. Continue to hold the Reset button for 10 seconds then release it. NOTE: After the reset, the router’s IP Address will be set back to its default IP Address 192.168.1.1. Wait for about one minute. Then, turn on the computer which is wired to the router, launch a web browser (i.e. Internet Explorer®, Safari®, or Chrome™). Enter the router's default IP Address 192.168.1.1 in the Address field and press [Enter]. NOTE: If you accidentally get the Management Mode, you can exit by simply unplugging the power cord from the router and by plugging it back in. The Management Mode - Firmware Upgrade interface should appear. Click Browse to locate the firmware file and then click Apply to start the firmware upgrade process. 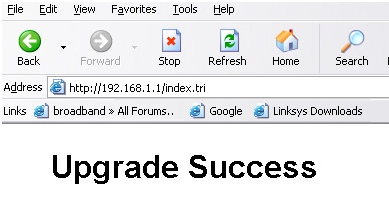 Once the firmware upgrade process has successfully completed, an Upgrade Success message will appear to confirm that the upgrade has ended. Unplug the power cord from the back of the router and plug it back in. This will restart your router using the new firmware. NOTE: If the Management Mode interface comes up again after doing a powercycle or a reset, you may launch a different browser (i.e. Mozilla Firefox) or try a different computer that is wired to the router and then check again.